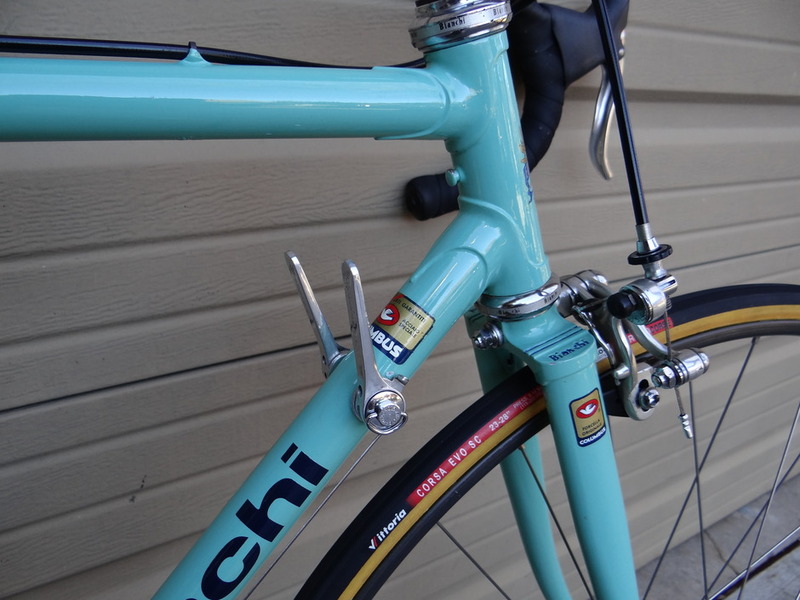 "Bianchi Formula Two Tubing - Probably a mix of Columbus SP and SL tubing. I'll have to look for a PM from T-Mar a few years ago. I believe he said these were thought to be a SL and Alle or CroMor mix. They used the same frame on 4 of the Italian bikes in '86, 5 in '87 and 3 in '88. I think they would have been hard pressed to get a SL/SP bike down into the $600 price range." Interesting about Formula Two being an SL and Alle or CroMor mix, that makes sense. The Giro takes a 27.2mm seatpost which would indicate an SL seat tube. The bike fits and handles perfectly (for me) but rides like a truck and weighs a ton compared to similar Bianchi models. 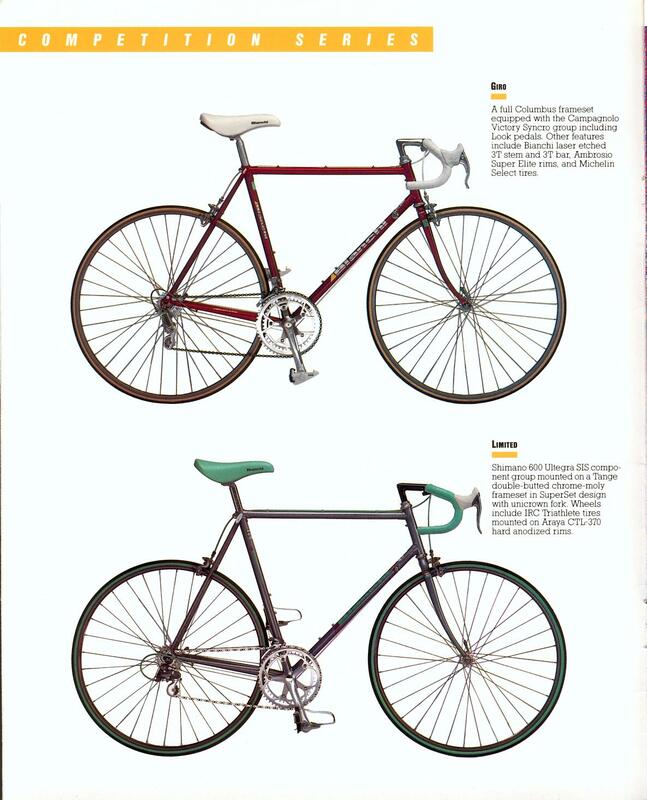 I originally came up with the Giro 1987 model date from Marc Bulgier's catalog web site. I forgot that he later changed the catalog from 1987 to 1988. Things aren't always what they seem... Don't believe everything you think! Lugged steel Reparto Corse frames were Bianchi's the top of the line models, hand made in their special pro shop just like Raleigh's SBDU shop used to be. Some of them have a Reparto Corse label. All Reparto Corse Bianchis from the C&V era with lugged steel frames had Campagnolo dropouts. Those with Gipimiemme dropouts weren't Reparto Corse frames. Note, not every frame with Campy dropouts is a Reparto Corse. Last edited by verktyg; 11-19-17 at 09:20 PM. Although Zeta and Aelle have a really nice ring to their names for base-level tubing. 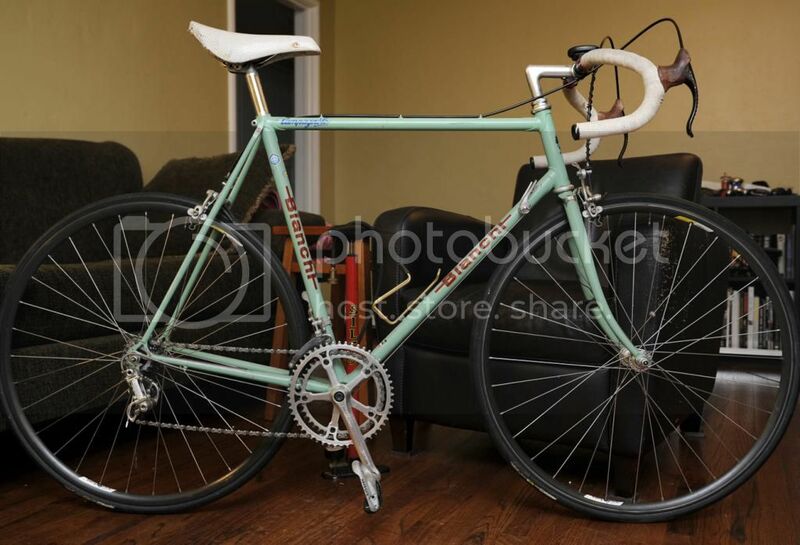 Bikes: Bianchi Sempre Pro, Orbea H40, Bianchi Mega Pro Pantani Replica, various old bikes. Eucalyptus oil removes glue very well. My Giro takes a 27.2mm seatpost which would indicate an SL seat tube with a 0.6mm wall thickness. Aelle had a 0.8mm wall thickness in the seat tubes which would have used a 27.0mm or 26.8mm seatpost. Zeta seat tube wall thickness was 0.9mm whuch would have used a 26.6mm or 26.8mm seatpost. I've always heard that Fomula 2 was a blend of SL and SP tubes - probably whatever they had on the shelf... Tubo del gas? Last edited by verktyg; 11-19-17 at 09:22 PM. I's always heard that Fomula 2 was a blend of SL and SP tubes - probably whatever they had on the shelf... Tubo del gas? Sounds right, I have a Purple Limited built in Italy, Italian BB, Formula 2, it also takes a 27.2 seatpost. Why would you use a SL/SP mix frame on 5 different models but not advertise it as SL/SP? Nice looking Bianchi but why are the decals wrong? is it a repaint project bike? I saw the over spray paint mark on the dropout? But still Beautiful Lo! ! ! They were second tier models??? Because Columbus didn't have any tubing stickers that said SL/SP??? Columbus and Bianchi like most companies never mentioned what the forks and stays were on their bikes with only the 3 main tubes made of a premium tubing. TRETUBI for example. During the 60s and very early 70s, quite a few French bikes came with Reynolds 531 main tubes and Durifort forks and stays -Zeus too. They had Durifort decals on the forks. BG, I think that the real reason was that frame tubing stickers were more of a marketing tool than anything else. Back during the bike boom, a number of British makers made frames with the 3 main tubes straight gage Reynolds 531 while the rest of the tubes were who knows what. Bike buyers in the US became aware that a bike made of Reynolds 531 tubing was special. Little did they know of all the different Reynolds decals and what they meant. Last edited by verktyg; 11-30-14 at 10:48 AM. Repainted 20+ years ago after I rode and raced the heck out of it for the first 15 years, they used whatever was available at the time. Last edited by okie1kenobi; 11-30-14 at 11:36 AM. Too bad had I know my Formula 2 bike was SL/SP I would have asked more for it when I sold it. >My Giro takes a 27.2mm seatpost which would indicate an SL seat tube with a 0.6mm wall thickness. Great discussion on Formula 2 Tretubi. I'd like to contribute a thought though. I have a 1989 Quattro with Columbus Cromor stickers. I am 99.999 percent certain it has a 27.2 mm seatpost (not by me to check conveniently). The snippet I quote states a 27.2 seatpost signified an SL tubing - but given my bike, Cromor apparently also uses 27.2, so I always thought Tretubi was essentially a Cromor frame. I have essentially the same bike, but I believe mine is a 1981 (1.Mxxxx S/N) and yours is a 1982 (2.Axxxx). Delightful and fast bike, but a little twitchy in a crosswind. Since mine is charcoal -- my wife, a professional artist, calls it Ralph Lauren brown -- I cannot show it in this thread. I would like to add my own Bianchi to the mix. It's a 59 cm 12-speed Campione D'Italia i bought and raced during high school. I graduated 1984 so I'm guessing i bought it 81-83. Not sure where to find the serial number, nothing but 2•A on the drive side of the seat lug and 156 on the opposite side of the seat lug. The bike shop i bought it from said it was a "budget-racer." those guys are still around 30+ years later but run a different shop here in town now. >[COLOR=#000000]My Giro takes a 27.2mm seatpost which would indicate an SL seat tube with a 0.6mm wall thickness. Great discussion on Formula 2 Tretubi. I'd like to contribute a thought though. I have a 1989 Quattro with Columbus Cromor stickers. I am 99.999 percent certain it has a 27.2 mm seatpost (not by me to check conveniently). The snippet I quote states a 27.2 seatpost signified an SL tubing - but given my bike, Cromor apparently also uses 27.2, so I always thought Tretubi was essentially a Cromor frame. Hmmm, Just looked at a Formula 2 sticker closely. I never realized that Formula 2 was Tretubi... I always thought it some kind of mystery Columbus tubing blend. No wonder my Giro weighs a ton and rides like a truck! The "Tretubi" stickers indicate that only the 3 main tubes are made with the designated type of tubing. The forks and rear triangle are made with some other kind of tubing - usually a lesser grade of steel (like seamed "Tubo Del Gas" Gas Pipe Tubing)! 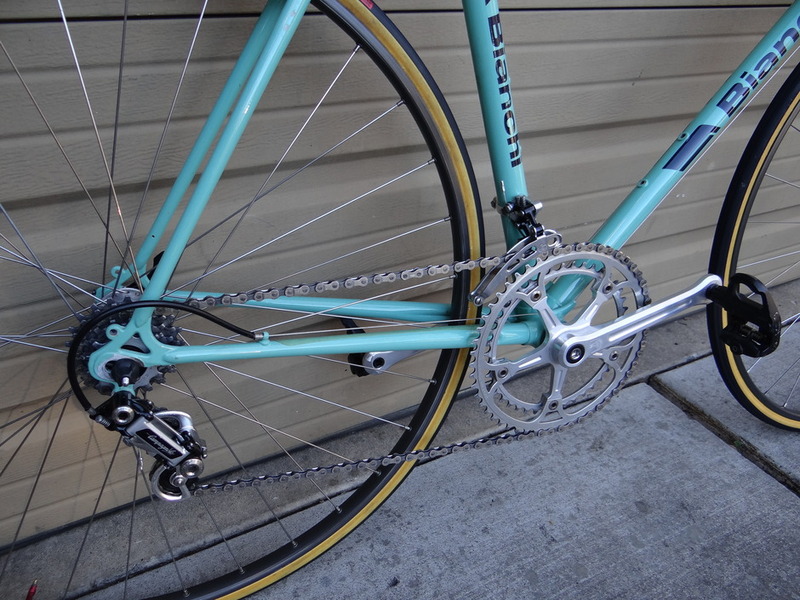 My 1981 Bianchi Campione Del Mondo has a Tretubi frame. The 3 mian tubes are most likely Columbus SL tubing while the forks and stays are supposed to be made of Falck tubes. It's as light as a Columbus SL frame and rides better than the other SL frames that I have... So Tretubi is not all that bad. See Cromor info below. Chromor was made of Chrome Moly steel just like SL and SP but the tubing was seamed before being rolled and drawn into shape. In the drawing and butting process the seam weld became so homogeneous that it's virtually seamless. SL and SP were made from solid steel billets that were pierced and drawn over a mandrel as pictured. The seat tube in Cromor tubing was 0.9mm x 0.6mm thick just like SL so it takes a 27.2mm seatpost. The down tube was 1.0mm x 0.7mm x 1.0mm like SP and the top tube was 0.9mm x 0.7mm x 0.9mm, slightly heavier than SL. Overall, Chromor was just a few grams heavier than SL, just less expensive to produce. Here's a BF discussion about Cromor and other Columbus tubing. Last edited by verktyg; 12-10-14 at 04:09 PM. What I meant to say in my post was that I had always thought Tretubi meant the 3 main tubes (not the entire bike) was made of Cromor-caliber stuff. As you mention, the seattube sticker implies the fork is not made of Columbus. But I haven't always been particularly sure about that. The Formula 2 fork sticker says words like Columbus, fork, tubing, and no mention about Tretubi (look it up, as I don't have the sticker nearby). In isolation, looking at just the sticker on the fork, you'd be convinced the fork is made of Columbus tubing. So it opens the possibility that the 3 main tubes are Columbus, but so is the fork (assuming the seattube Tretubi sticker is referring to the frame ONLY, and not the fork, which is certainly conceivable. Again, I'm saying the associated fork sticker for Tretubi leaves open the possibility that it is made of Columbus tubing (or at least, makes the issue ambiguous). So basically, based on what I've read on the stickers and in places, I've always considered a Bianchi Formula 2 Tretubi frame to have 3 main tubes that were basically Cromor level, and a fork that may possibly be of Columbus tubing also. I never envisioned a Formula 2 Tretubi as having SL tubing, given how mass-produced those low-mid range bikes were. All this said, I believe that these differences in tubing are secondary to the actual manufacturing process of the frames themselves. If we consider that almost fully-blinded experiment in the 1990s printed in one of the big cycling journals (the Magnificent 7), given that the riders couldn't distinguish the best material from the worse one, it tells me technique in frame manufacturing significantly exceeds tubing in terms of importance WRT bicycle riding quality. I say this because "everyone" can tell a high-end Bianchi rides better than a low-end Bianchi, but given that, by themselves, tubing cannot be distinguished amongst identically-made bicycles, it implies that it's the skill/technique in the manufacturing process that distinguishes an average bike from an excellent one. As you can see, the fork tubing sticker says: Foderi Forcella Bianchi Formula Columbus. What does Foderi mean? I assume Forcella means fork. But in any case, unless Foderi means not-Columbus or something of the sort, the sticker certainly opens the possibility that it is made of Columbus (my guess is Cromor-level stuff) tubing. There are several overlaping themes here. 1. I mentioned Bianchi Formula 2 tubing in relation to my 1988 Bianchi Giro which has Columbus "FORMULA" decals on the fork blades. The Giro was an upper mid-range model in 1988. 2. I was also talking about Tretubi frame decals used on a lot of other brands of bikes as well as Bianchis. Many of those lower mid range bikes had unknown tubing in the forks and rear stays. There are lots of opinions as to what Bianchi Formula 2 tubing was made of. The seat tube decals say PRODUZIONE COLUMBUS meaning "produced" by Columbus. The decals go back 25-28 years and the original opinion was that Formula 2 was a mix of Columbus SP and SL tubes. Until this thread I'd never seen any mention that Bianchi Formula 2 was anything other than a mix or SP and SL tubes. I commented above that it was an interesting possibility that Formula 2 could have been something like Chromor or one of other mid range Columbus tube sets. As you mention, the seat tube sticker implies the fork is not made of Columbus. But I haven't always been particularly sure about that. The Formula 2 fork sticker says words like Columbus, fork, tubing, and no mention about Tretubi (look it up, as I don't have the sticker nearby). In isolation, looking at just the sticker on the fork, you'd be convinced the fork is made of Columbus tubing. So it opens the possibility that the 3 main tubes are Columbus, but so is the fork (assuming the seat tube Tretubi sticker is referring to the frame ONLY, and not the fork, which is certainly conceivable. Again, I'm saying the associated fork sticker for Tretubi leaves open the possibility that it is made of Columbus tubing (or at least, makes the issue ambiguous). I said nothing about forks in relation to Bianchi Formula 2 tubing.The discussion was about "Tretubi" main frame decals. If a decals says Columbus, Reynolds, Tange or whatever, it's a pretty good sign that a frame from a major manufacturer is made with that tubing. Those tubing makers jealously guard the use of their brand names. Over the past year, Reynolds has gone as far as getting eBay to stop listings for replica Reynolds decals. All of the Bianchi bikes made with Columbus Formula 2 and Columbus Special tubing that I'm aware of had matching decals on the forks. Please see my post above. It shows different methods for producing steel tubing. Bianchi used the same Formula 2 frames on several different models - those were mid range bikes - 2 or 3 models down from the top. NO! All things being equal, it's the wall thickness of the tubing that makes a difference in ride. Stronger high alloy steels allow for thinner tubes which are also lighter. Bicycle frames and wheels are dynamic not static - they move and flex in use. A lighter frame will absorb more road shock. Last edited by verktyg; 12-17-14 at 01:36 PM. 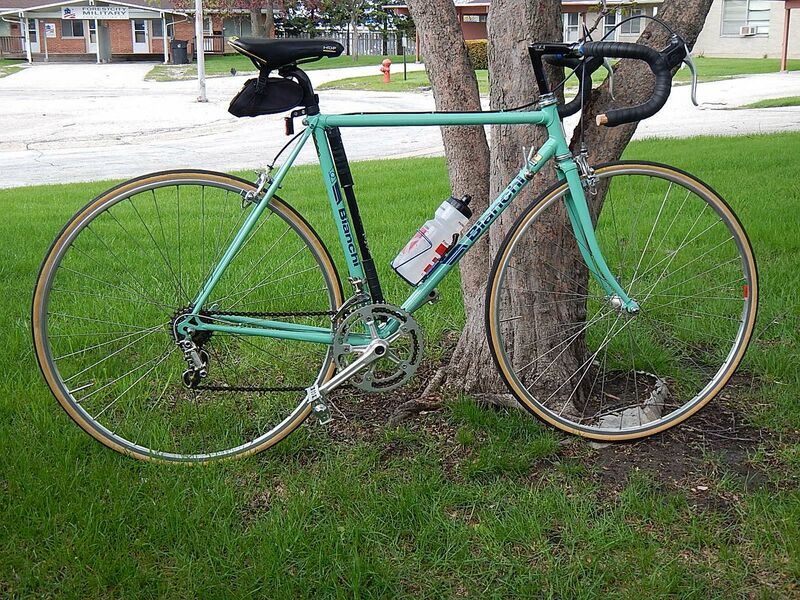 I still regret selling my mid-80s Bianchi Nuovo Record, which was my first nice road bike. If I had started bike commuting before I sold it, I would probably still own it because it would have been perfect for that. You don't find many Italian racing frames with fender mounts. 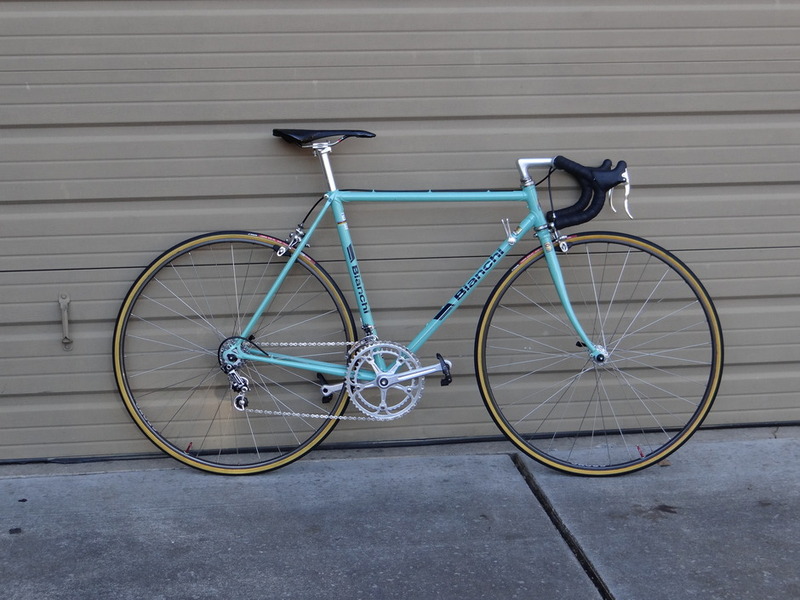 I still have a soft spot for Celeste and if I ever find a steel Bianchi cross bike in that color and my size and price range, I will snap it up. My only Bianchi. ' hope to acquire at least more in the future. Last edited by DVC45; 12-18-14 at 11:51 PM.